Stories by Domingo Santos, Juliette Wade (drawing on her cultural linguistic expertise), Dave Creek (another Mike Christopher story), Sean McMullen, Stephen L. Burns (canine politics), Michael F. Flynn (lots of fonts in the text), Donald Moffitt (time travel and the cops), Marissa Lingen, David W. Goldman, Norman Spinrad, Janet Freeman. Kate Wilhelm. The Bird Cage. 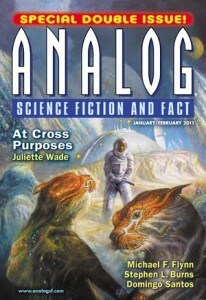 (Fantasy & Science Fiction, Jan/Feb 2011).